At GfM, we use our air jet mills (e.g. opposed and spiral jet mills) and mechanical mills (e.g. plate beater, pin and hammer mill) to perform micronisations in strict compliance with the cGMP guidelines (more than 30 mills available). From the first trial with just a few grams right up to tonnes, all with certified quality. 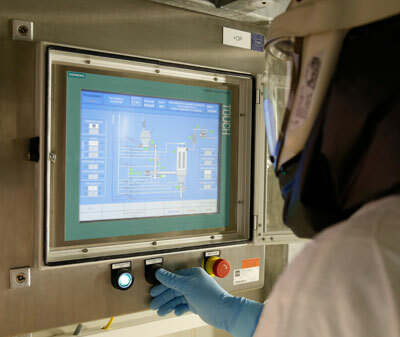 Aseptic micronisation is an important process step in the manufacture of sterile pharmaceuticals which cannot be sterilized in their final container. This is one of our company’s competitive advantages. We perform sterilization (method according to European Pharmacopoeia) to produce active ingredients and excipients free of germs capable of reproduction (sterile). 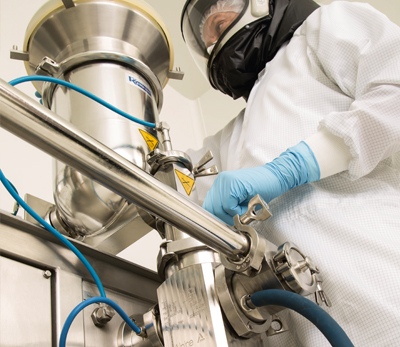 This can be followed by further production steps such as micronisation, blending and packing under aseptic conditions. We can produce homogeneous blends according to your specifications both prior to and following the micronisation processes. Modern container blenders mean that even larger quantities are possible at any time. 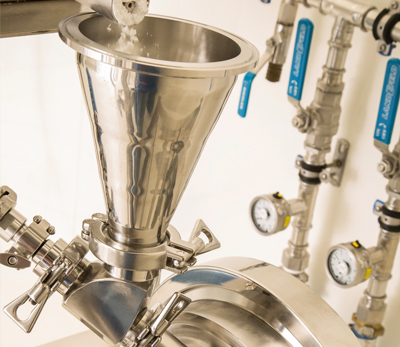 We perform specific sieving processes to fractionate your product into the grain sizes you specify. Modern technology allows sieving of even very fine material. In addition, we can offer protective sieving of your products before further processing in our plant. cGMP-conform micronization means having a valid process. We are pleased to offer this service by means of the validation of the product manufacturing process. Our service, in which all documentation for validation is closely coordinated with the customer and completed with a wealth of expertise, results in a quality standard which really pays off. 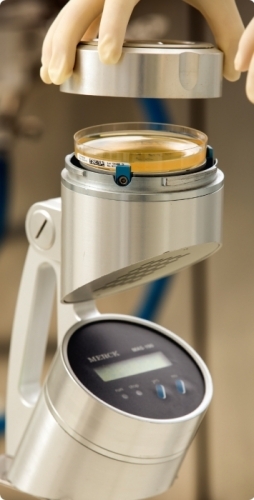 Whether for cleaning-, process- or measurement method validation, we are the right partner for your product. The Mastersizer offers you the possibility of dry dispersion as well as wet dispersion in an aqueous medium, oil or organic solvents for particle size analysis. We perform method development, validation and implementation for the Mastersizer as a service for you in our in-house laboratory and can even apply methods you already use in your company for particle size analysis following coordination. We determine the particle size distribution of your products for all standard sieve sizes with our Hosokawa Alpine air jet sieve. The software we use is FDA-compliant. In addition to air jet sieving, we offer sieve analysis with our vibrating sieves. With this method, we determine the particle size distribution of your product in one step with different mesh sizes. 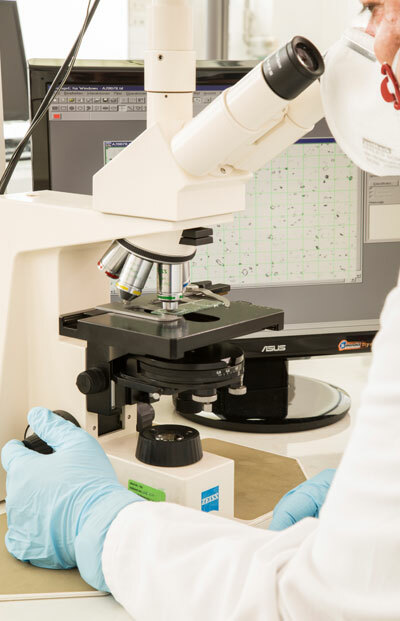 For determining particle size distribution we offer the possibility of microscopic image analysis, with digital software guaranteeing a measurement in accordance with cGMP. 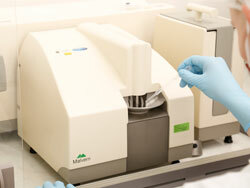 Microscopic analysis is also much used for the characterization of crystals. 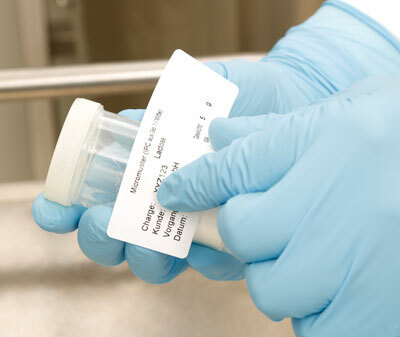 Microbiological monitoring of individual production areas includes surface contact tests (squeeze test), measurement of airborne germs as well as control of process air. 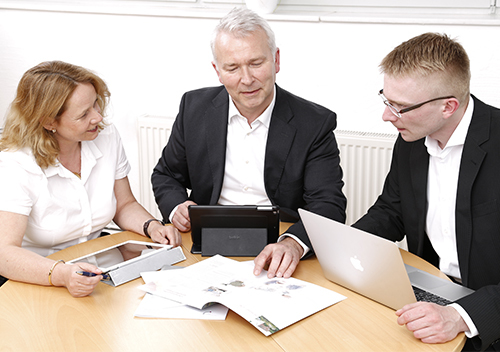 Our production employees and production facilities are regularly checked by contact tests. In addition, measurements are carried out to determine the air particle count in the chambers and the process air. Trend analysis are performed to ensure long-term compliance with the standard. Temperature, humidity and pressure measurements are generally carried out alongside productions and process validations. The environment parameters and the differential pressure are checked and documented at regular intervals. Our internal, independent laboratory performs cleaning inspections using HPLC analysis or TOC in order to monitor the success of our cleaning. 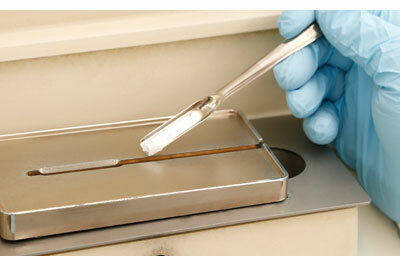 The samples are taken and inspected by our laboratory staff and we only use validated methods. On request, our experienced specialist staff can also conduct product-related cleaning validation procedures for you. Our success is based on the consistent implementation of cGMP guidelines regularly confirmed by the state authorities of Bremen. the active ingredients and excipients. Environmental protection is an important part of GfM’s corporate philosophy. The prevention of environmental contamination and its consequences plays a major role. 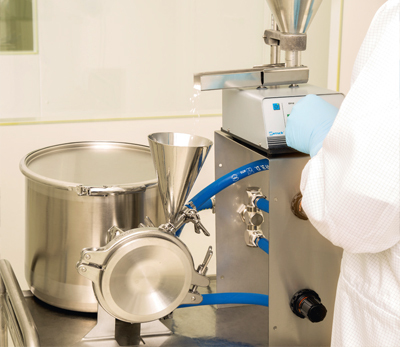 Compliance with cGMP guidelines ensures comprehensive protection. As our service range includes the processing of potent pharmaceutical products, we guarantee a high level of safety for our employees. This is possible, among other things, thanks to the use of functional protective clothing. Regular in-house training complemented with external advanced training ensure that our safety measures are always upto-date. The course of your analysis sample at GfM. From the first sample to the release.